Out of the many types of flanges like Blind Flanges, weld-Neck flange, Threaded Flange, Socket Weld Flanges, Spectacle Flanges and Lap-Joint Flanges which are used, Vacuum flanges are those which are used to connect each other including vacuum chambers, vacuum pumps & tubing at the end of the tube end. The flanges are used not only for scientific applications but also for various types of industrial applications as well. This is mainly due to the fact that these flanges allow diverse pieces of equipment to interact through a physical connection. The vacuum flanges are also used for vacuum maintenance, monitoring & manipulation from outside the vacuum chamber. You probably might know that there are numerous flange standards which exist. These may be in terms of differences in ultimate pressure, size and ease of attachment. When it comes to QF, it is called as Quick Flange. This is also the ISO standard quick release flange. It is also called by some other names as well such as KF (Klein Flange) or NW- it is also known as sometimes DN. The designation of KF has been adopted by ISO & DIN. QF or KF (Klein Flange) are made with a chamfered back surface which are attached with a circular clamp as well as an elastomeric o-ring which is mounted in a metal centering ring. It is usually available in a wide range of sizes. These are measured by the nominal inner diameter. As a result, there are some common model numbers are signed as DN16KF, DN25KF, DN32KF & DN40KF and so on. A large number of vacuum flange standards are available under vacuum flanges which are manufactured in India. Many manufacturers deliver customized flanges and other products throughout the world. The CF Flange is abbreviated as ConFlat and originally was known as CF Flange. It uses a copper gasket & knife-edge flange in order to achieve Ultra High Vacuum seal. If you are on the lookout for one of the best flange guards manufacturers in India then Indana Steel is one of the leaders in the field. We supply all types of flanges at the best prices. This is another very popular flange. It is also known as LF, LFB, MF, or sometimes even just as ISO flange. 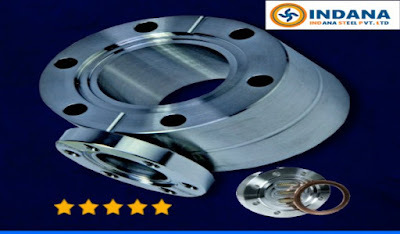 You must take note that this kind of flange sometimes is also similar to the previously listed one at the point where the flanges are connected by both a centering ring and elastomeric o-ring. This type of flange is further sub -divided under two categories i.e. ISO-K and ISO-F flanges. ANSI embraces a flange standard that is called as ASA. Moreover, these flanges are elastomeric o-ring. These flanges are ones which could be used for both vacuum as well as pressure applications. You would get to know about the size of flanges by the inner diameter of the flange or by the outer diameter . In conclusion we hope we have been able to give you affair idea about Vacuum flanges. To know more about flanges and other industrial fasteners please visit our blog. · How to contain flange spillage & splashes? Why Kevlar Is Important In PTFE Flange Guard?